We had another great time at the ASD Halloween carnival. 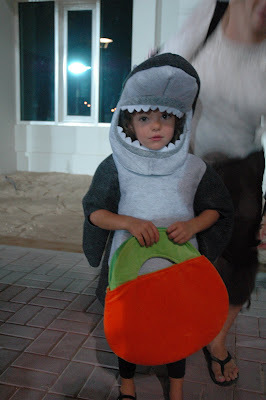 I dressed up as a shark! And used by bag to get lots of candy. Skyelar was dressed as a pumpkin, but she slept through the whole thing. Here I am trick or treating in the spooky haunted house. Here I am with my best friend Aidan who was dressed a s dragon. Great costume! This reminds me of the land shark skits on the old Saturday Night Live. Did your mom make the costume for you? I think you make a very cute shark.